While perusing various blogs off the ScrapShare Blog Roll (in the sidebar) this weekend, I encountered a Label Cloud on Tonia's blog that I just had to get. Tonia was so helpful in providing the source for the widget and I added it this evening - and a new obsession was born. I realized that I had lots of single labels. The OCD side of me kicked in and I then spent the next hour re-organizing the labels of my posts. I started blogging before the Labels functionality existed, so many of my earlier posts didn't even have labels. That's no longer the case. Blogger's Label Action functionality is a little bit clunky and time consuming, but I think I am getting better at it. 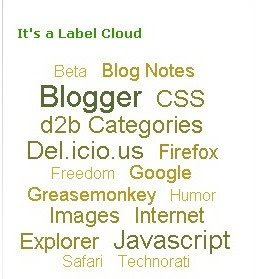 So, if you want the Label Cloud, go to this link: Get Label Cloud Here. But be forewarned - it may lead to endless label putz-ing.